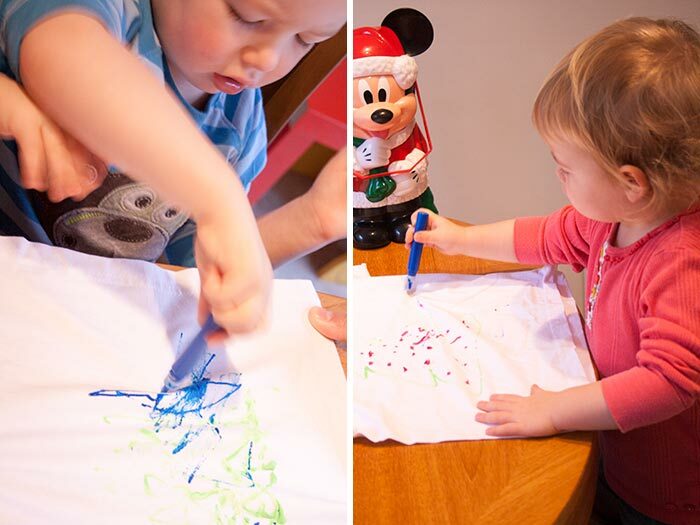 Home > Kid's Activities > Rainy Day Activities for Toddlers to Help Everyone Stay Sane! Don’t you just hate being stuck inside on a rainy day? I don’t know about you but I sometimes find entertaining toddlers all day a real challenge. Sometimes its nice to just get out of the house for a change of scenery, or to allow them to run off some of that excess energy. But over the past few weeks we’ve found ourselves housebound due to a mixture of wet weather and the dreaded flu. To help us all stay sane, and keep us away from the television, I’ve been trying some new rainy day activities for toddlers and I thought I’d share them here with you. Miss E loves bubbles and loves to dance in them and try to catch them on the end of her nose! 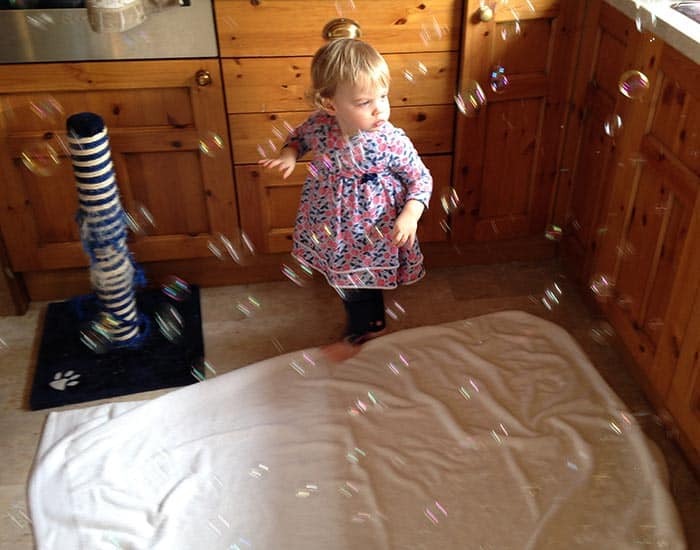 Playing with bubbles can keep her entertained for quite some time, but it can be quite tiring to keep blowing all those bubbles so we invested in a bubble machine! We bought a water table for the kiddos for their birthday. Since it’s going to be some time until it’s warm enough to go outside and fill it with water we decided to fill it with dried pasta instead. They had great fun practising their pouring and scooping. 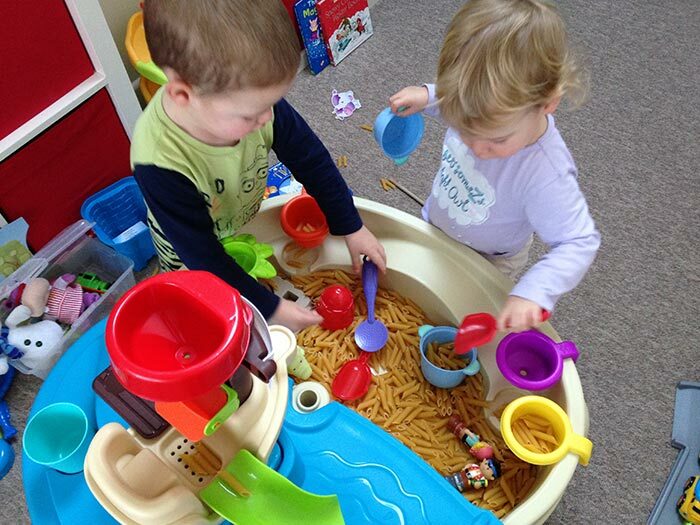 Check out our indoor water table play collection for more great ideas! The team over at Buy Tshirts Online sent the kiddos a gift box with some great quality Fruit of the Loom shirts and some fabric paint. 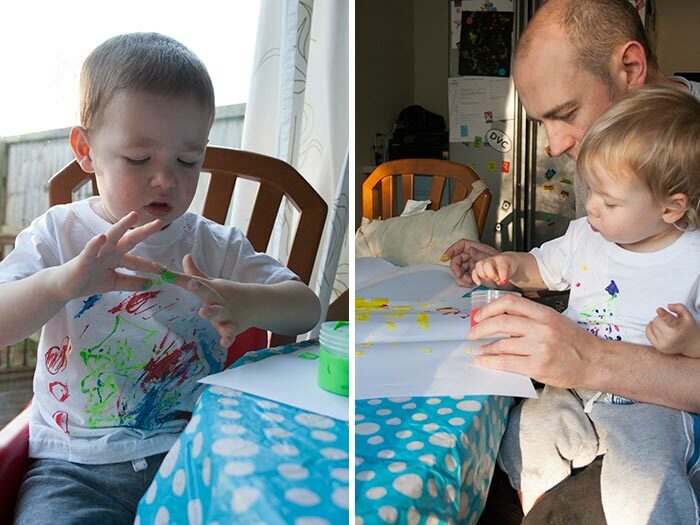 They had a blast decorating their own shirts and then wearing them to show Nanny and Grandad afterwards. I think this would also be a great birthday party activity for toddlers and older children too. This is currently Master J’s favourite activity. It’s super simple to set up and mess free. 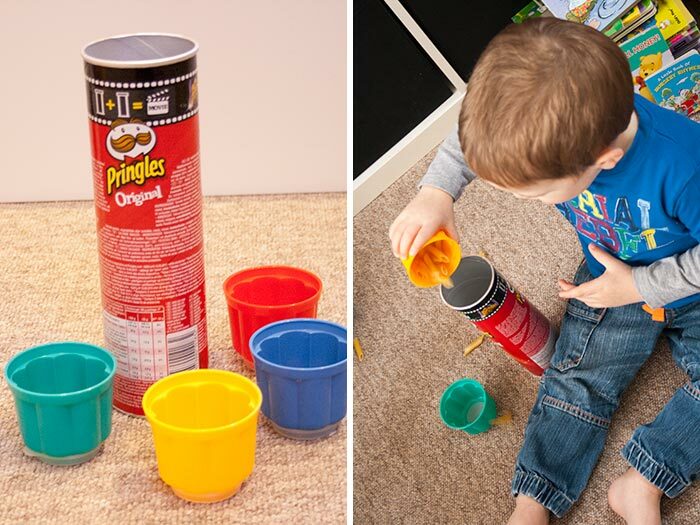 I just took a Pringles canister and filled it half way with dried pasta, then added some colourful jelly cups, but any pots will do really. He sits there for ages just tipping the pasta between the containers. My brother made me a huge pinboard wall in the dining room and we are slowly filling it up with paintings and other art creations. Right now the kiddos love finger painting, enjoying exploring the textures of the paint as much as actually putting it on the paper! 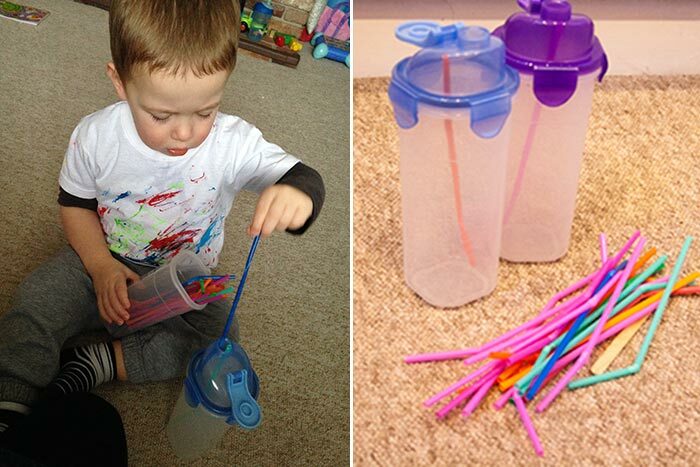 These smoothie shakers and a handful of drinking straws will keep my kiddos quiet and engaged for quite some time. So they’re good not only for rainy days but also for keeping them occupied in the doctor’s waiting room or in a restaurant. Posting the straws in through the hole in the top is an excellent way to develop their fine motor skills and hand eye coordination. 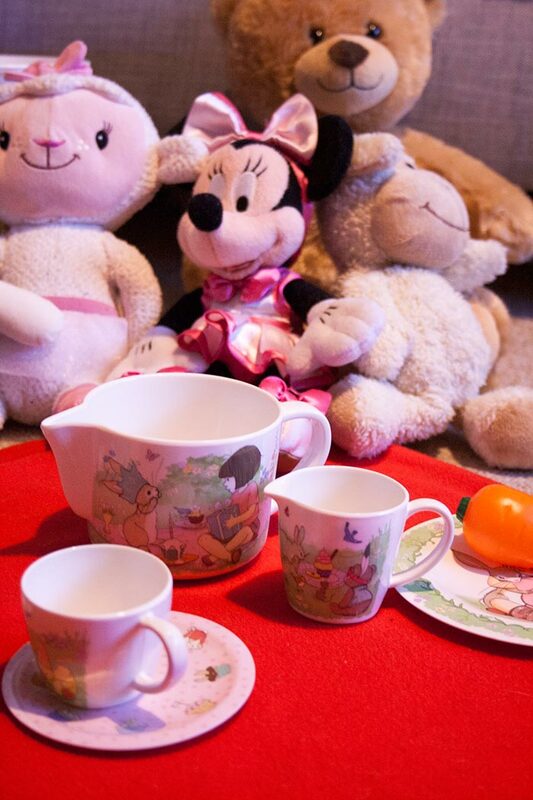 Pretend play is so important for toddlers, and Miss E loves hosting a tea party for her teddies. Her grandparents bought her this melamine tea set for Christmas and it is just beautiful. It should stand the test of time and I can see her playing with this for years to come. I picked up a couple of packets of coloured pom poms thinking they might come in handy one day and Miss E found them in the cupboard and wanted to play with them. 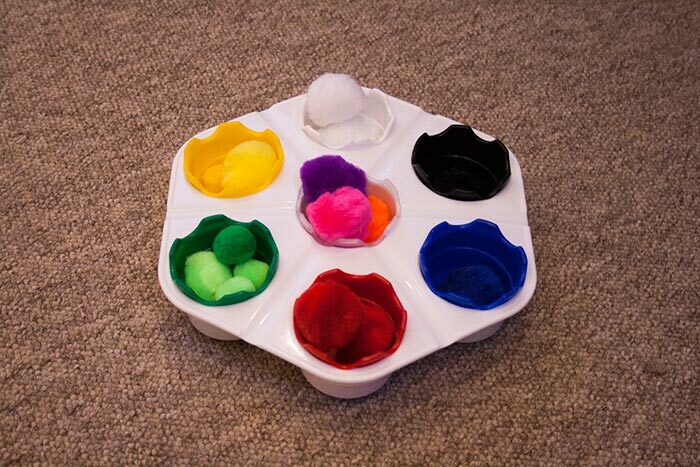 I spotted our paint tray which has different coloured pots making it perfect for a colour matching game. This box of wooden blocks was gifted to us by a neighbour whose grandson had outgrown it. 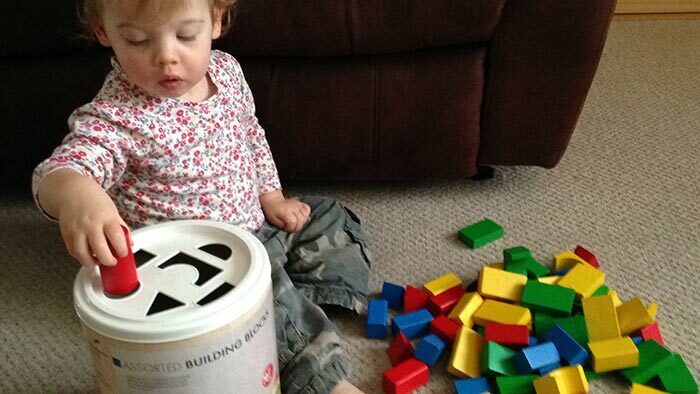 I love it because it has a shape sorter in the lid and both kiddos enjoy posting the shapes through the holes. Stickers! 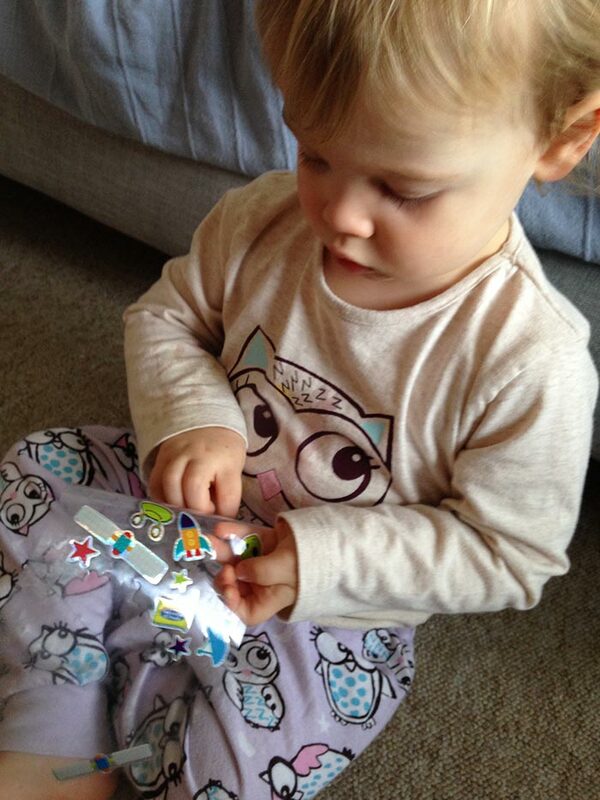 Miss E just LOVES stickers right now. She loves peeling them off the backing paper (great fine motor practice) and sticking them either in her book, on her clothes, or sometimes all over her brother! Our favourite sticker books are of course from Usborne, I love that they can learn so many different things while “playing” with stickers! If you don’t have any stickers to hand just try post it notes instead! I learned about this activity from this book: 101 Independent Activities for Toddlers and Preschoolers. 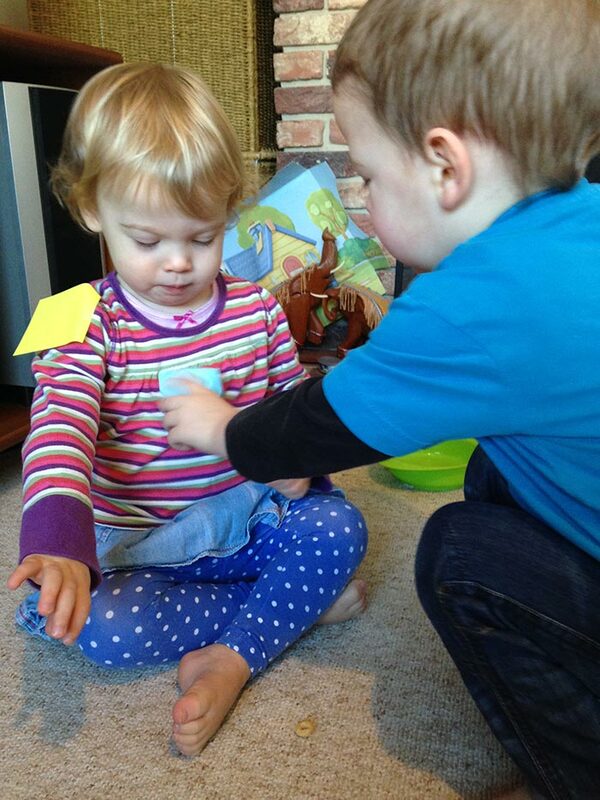 The kiddos love sticking the post its all over each other! 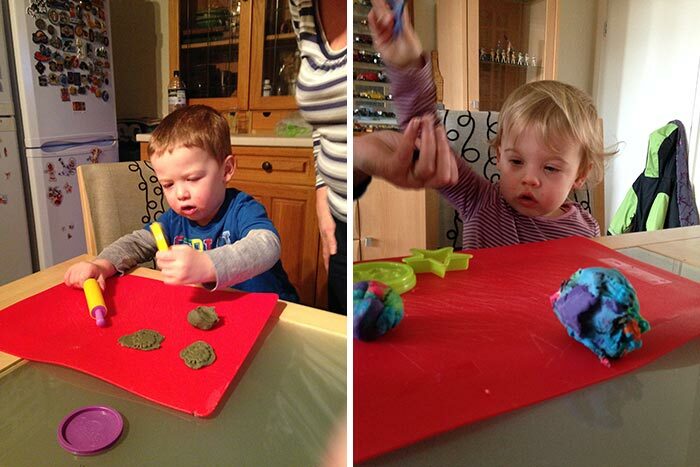 The new favourite activity this month is play dough. We spent most of last summer collecting up sets at car boots and charity shops so we have a huge box of shape cutters and rolling pins. All you need to get started though is a simple play dough recipe and some plastic cookie cutters. 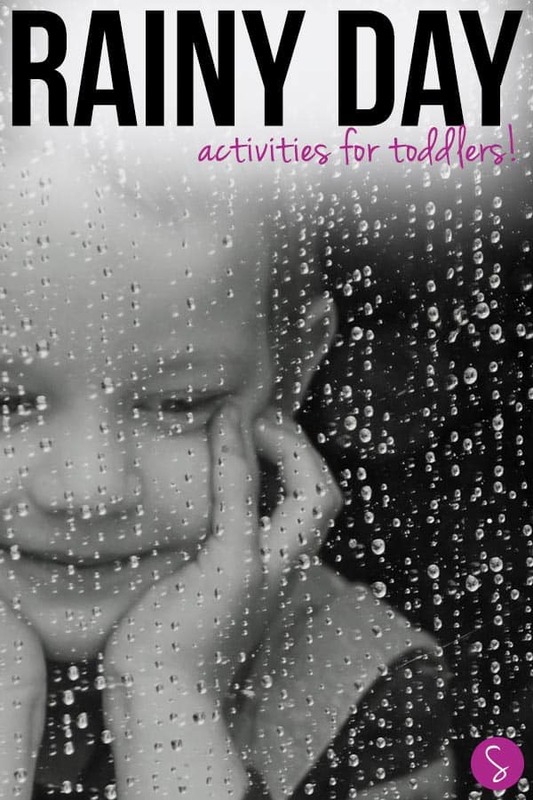 Phew – that’s an awful lot of rainy day activities for toddlers! Some days I wonder if I’m doing enough to help my kiddos learn through play, but looking back through these photos and seeing all the fun things we’ve been doing over the past month make me a feel a little better! 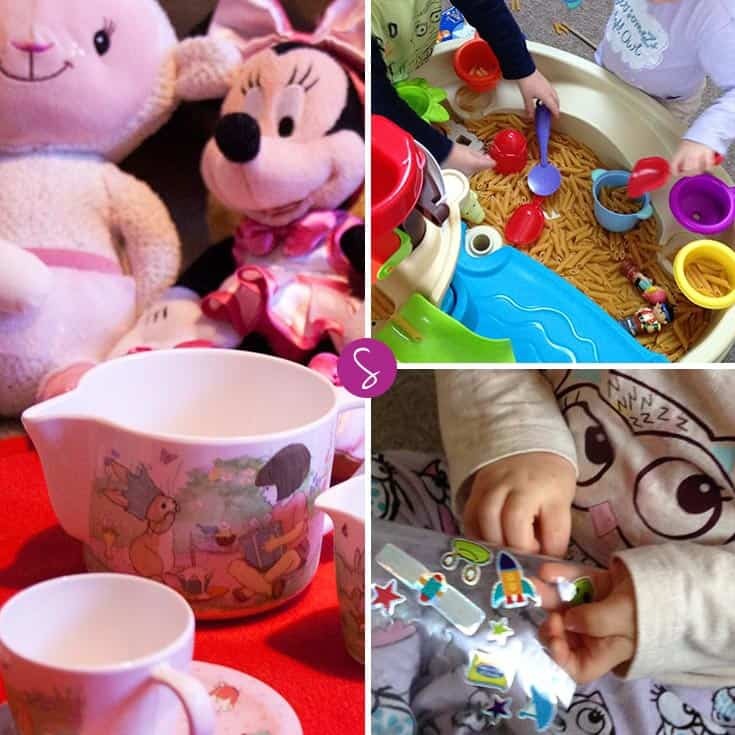 ~Clare – currently pinning to Fun Toddler Activities.